Buying and holding stocks for the very, very long term can be difficult in a market where investors seem to chase the hottest daily trend. But holding stocks for years or decades can lead to market-crushing returns with the right investment. We asked three of our Foolish contributors for their best stock idea for decades to come. The answers ranged from Canopy Growth (NYSE:CGC), the marijuana industry leader, to utility NextEra Energy (NYSE:NEE) and tech giant Microsoft (NASDAQ:MSFT). Here’s why we think these stocks are well positioned for the long term. Todd Campbell (Canopy Growth): I’m going to go out on a limb here and recommend Canopy Growth, Canada’s largest marijuana company. Undeniably, there are significant global regulatory risks associated with marijuana that could derail this company’s future, but I think the odds are that we’ll continue to see worldwide deregulation of cannabis, and if I’m right, then stashing a little Canopy Growth away in a long-haul portfolio could be akin to buying shares in alcohol companies following the end of prohibition in the 1930s. Canada’s medical marijuana market has been successfully operating nationwide for years, and last fall a national adult-use market opened there, too. Canada’s marijuana market is worth $6 billion Canadian dollars annually, according to Statistics Canada, so it represents a major opportunity for Canopy Growth, which boasts market share above 30% in Canada’s medical marijuana market. Canopy Growth reported quarterly results that include the first six weeks of recreational sales last week, and its growth hints at the potential associated with Canada’s adult-use market. Its revenue was CA$83 million in the quarter, up 282% year over year. There’s an even bigger opportunity outside Canada. Worldwide, the marijuana market is worth about $150 billion, according to the United Nations, including $50 billion in the United States. Most marijuana sales in the U.S. still occur on the black market, but 33 states have passed pro-pot laws in some form, and the U.S. Farm Bill recently removed hemp, a type of cannabis, from the controlled substance list. This prompted Canopy Growth to announce plans in January to spend up to $150 million establishing hemp processing operations in New York. Those operations could, conceivably, allow it to capitalize on the U.S. marijuana market if Congress reclassifies it someday, too. Canopy Growth is a high-risk stock, though, so it should only represent a small portion of portfolios. Nevertheless, the size of the potential opportunity makes it a stock that warrants “stash-away” status. Matt DiLallo (NextEra Energy): Utility NextEra Energy has invested tens of billions of dollars to build one of the cleanest companies in the energy sector. Those investments have turned it into the world leader in generating electricity from the wind and sun. On top of that, it operates a large-scale natural gas pipeline business as well as a growing energy storage operation. These investments have paid off, as NextEra Energy has been able to grow its earnings at nearly triple the rate of its peers in the utility sector. That high-powered earnings growth has helped the company not only generate peer-leading returns but consistently beat the market over the last several years, outperforming 86% of the stocks in the S&P 500 since 2005. That trend appears poised to continue in the future given that NextEra Energy aims to keep betting big on renewables. The company currently plans to invest $40 billion into the sector through the end of next year, which should generate above-average earnings growth. Meanwhile, it should have no problem continuing to expand in the decades ahead given the gargantuan size of the renewables market opportunity. Add in the company’s above-average dividend, which NextEra aims to continue increasing, and this is an ideal stock to buy and hold for the ultra-long term. Travis Hoium (Microsoft): The world of technology is now dominated by a handful of companies who have the scale to compete to provide the services millions, or billions, of people need. For Microsoft, that initially meant providing an operating system that computers ran on, but now it increasingly means the cloud services that are the backbone of the apps and software companies we interact with every day. The strategic change was drastic, but CEO Satya Nadella has shifted Microsoft’s focus rapidly since taking over five years ago. The ability to shift strategies is key because tech companies have to adapt and evolve over time. In the long term, Microsoft’s financial performance speaks for itself and shows how well the company adapts. Despite PCs becoming less popular, the company is generating more revenue and free cash flow than it ever has before. Given how ingrained Microsoft’s cloud services are in the day-to-day operations of thousands of businesses, it’s hard to see how its operations will be disrupted quickly. It now has a cloud-based cash flow machine that will grow as software-as-a-service businesses become more common. 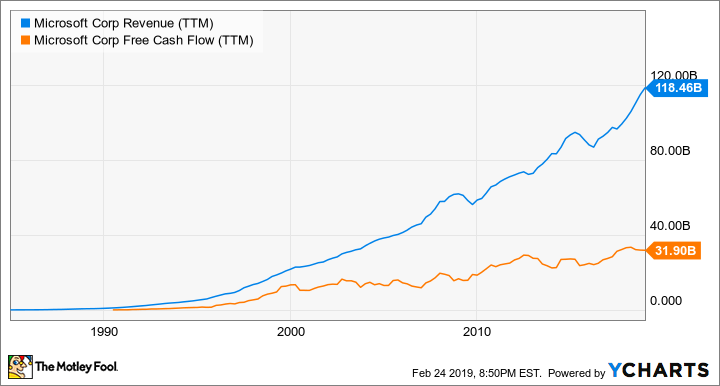 Microsoft’s P/E ratio of just under 26 won’t make it the cheapest stock on the market, but its long history of growth and cash flow generation make this a stock worth paying a premium for. Canopy Growth, NextEra Energy, and Microsoft couldn’t be more different, but they all have strong positions in their respective industries and long-term growth prospects. They may be see ups and downs along the way, given the volatility their industries see, but over the long term they’re set to be winners for buy-and-hold investors. Teresa Kersten, an employee of LinkedIn, a Microsoft subsidiary, is a member of The Motley Fool’s board of directors. Matthew DiLallo owns shares of NextEra Energy and has the following options: long January 2021 $85 calls on Microsoft. Todd Campbell owns shares of Microsoft. Travis Hoium has no position in any of the stocks mentioned. The Motley Fool owns shares of Microsoft. The Motley Fool recommends NextEra Energy. The Motley Fool has a disclosure policy. Next Article » Is the Recent Market Run-Up One Big Short Squeeze?